Rosie Ming (Sandra Oh, a perfect and delightful fit) is a self-published multiracial poet from Vancouver who would take more pride in her work if she wasn’t so shy. However, she’s quickly filled with amazement when a poetry festival in Shiraz, Iran reaches out to invite her to the exclusive event; Rosie’s friend Kelly (Ellen Page, voicing a brief cameo) is just as thrilled. Despite her grandparents skepticism, Rosie decides to take the bull by the horns and travel to Shiraz. There, she meets different international entrants (including a stuffy German poet amusingly voiced by Don McKellar), leading to thought-provoking discussions about art and unity. Strangely, everyone seems to have a loose connection to Rosie’s wayward father. Window Horses has been assembled with curiosity and grace. The crisp animation changes in order to experiment with the poems being read or to match Rosie’s perceptions on her trip. Even the character designs seem as if they’ve been crafted by an innocent soul grappling to identifiable qualities. In that respect, Rosie herself – a simple stick figure – could very well be a representation of feeling bare in an engulfing, overwhelming world. The shift from visual art to a profound coming-of-age story is gradual in Window Horses, with only some of the content flying too high over our head. Ann Marie Fleming effortlessly maintains the weight of the story without losing the film’s imaginative mind. Meanwhile, the audience – more informed than we were before – is stimulated in ways that ignite creativity and thought. 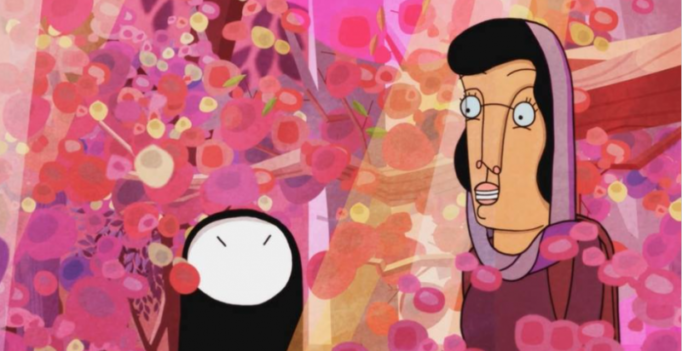 Window Horses is truly a one-of-a-kind.